Divineforge.com: Penang Property For Sale? Penang, in my own impression is a strategic location, and high potential area for development. It attracts a good number of tourists, a fair island just nice to boost up the real estate property value. So by chance, and I get to have a look of this website that known as Propwall that shows good information about the properties available for sale in Penang. The website doesn't use any impressive presentation factor, such as animation, fancy design or slide open classified information, it is rather a pleasant looking with common design, directory-like information website. However, in its functionality wise, it has good deals of general information about each property that is listed in the classified page. Taking Penang location for example, it has 1000+ listed ads spread across different location from Air Itam to Tanjung Tokong. In fact, the website seems to be suitable for property agent, property investor; which in short serves well for buyer, or seller, and those who're interested in renting the unit. It comes with a handy mortgage calculator on the left side bar of the classifieds page. Besides, the view count appears next to the classified ads, seems to hint how attractive/popular the property is to its visitors. It is free to register an account, which allow to post "Property to sell" classified ads (which is Free for Basic Ads, RM10 for standard, and posting a Premium classified ads that would be featured exclusively at the left side bar for RM50). In total, it provides 4 types of classified ads posting service, "for-sale, for rent, wanted to buy / wanted to rent" ads. One of the loving feature that I notice, is the integration with Google map that pin points the location of the property for sale; and it's really a nifty feature to me. Once we selected a classified ads, the top navigation bar buttons will change to reflect additional details about it. This includes a photo gallery of the unit. Which I think it's normal, and important feature it should have, that helps people like us to glance through the property easier by just surfing web.. Nonetheless, I'm a little surprise to see it has some sort of analysis and detailed information page about certain properties. 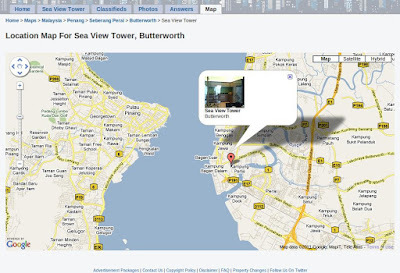 for example, when I check on the "Sea View tower" classified ad, there is a tab "Sea View Tower" on the top navigation bar, clicking on it and I discover, it's a page contains information such as property details, layout, facilities, analysis etc.. Though there isn't any email subscription for property classified update (not that I discovered at time of writing), there is a Facebook plugin that allow us to 'Like it' to keep us posted in Facebook. (Surely it's limited to Facebook user) Like it or not? It's a matter of personal choice; to me, I would say it's a worthy reference to property investor.